“As many of you know, I am an avid follower of ‘football,’” Francis quipped, “but where I come from, the game is played very differently!” in reference to “fútbol,” the Spanish name for soccer. The pontiff suggested that the principles that make for truly great athletes are virtues that society as a whole needs desperately. “Teamwork, fair play and the pursuit of personal excellence are the values – in the religious sense, we can say virtues – that have guided your own commitment on the field,” the Pope told the delegation, which included Dallas Cowboys owner Jerry Jones, who will be inducted into the Pro Football Hall of Fame on August 5. Jones was joined by six previous Hall inductees, including Curtis Martin, Ronnie Lott and Franco Harris, in his meeting with the Pope. “Yet these same values are urgently needed off the field, on all levels of our life as a community,” Francis said. The teamwork necessary for winning at football is just as important for building up society, he said. “How greatly our world needs this culture of encounter!” he said. 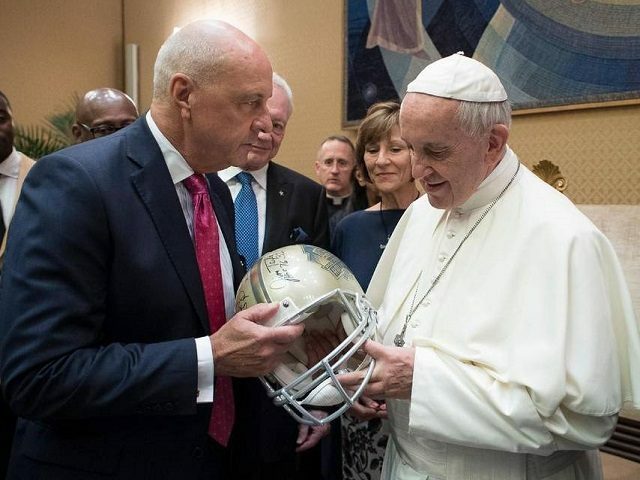 The Pope often meets with athletes of different sorts, and has constantly praised the hard work, discipline and teamwork that make for great sports. Earlier this year, Francis became the first pope in history to bless the Super Bowl, sending a video message with his benediction to participants and viewers of the sporting event. “May the Super Bowl this year be a sign of peace, friendship and solidarity to the world,” Francis said in his native Spanish, in a video message released on Super Bowl Sunday. He also invoked “God’s blessings of joy and peace” on the delegation, as well as their families.